While many operators complain about the start-stop nature of multiple drops, spare a thought for Matthew Nitschke who regularly has 17 or more drops a day. Matthew operates a diverse family business that has its origins in 1912 with Fredrick Nitschke, Matthew’s great grandfather. Among other things, the company produce chaff that is sold throughout South Australia, New South Wales, Victoria and Queensland. "I run to Sydney and in Victoria and we have Martin Air who delivers chaff to Queensland," Matthew explains. "He pilots road trains to Toowoomba and Brisbane and it ends up in Mackay, Rockhampton, Townsville and Cairns." While it is one thing to produce something, Matthew says the trucks are an integral part of the Nitschke operation. Matthew drives a new Kenworth K200 8x4 and pulls a super dog trailer fitted with tautliner bodies. He recently traded his Volvo in on the K200 through the Mildura Truck Centre. "My other truck is a Kenworth K104; it’s a fantastic truck," he says. 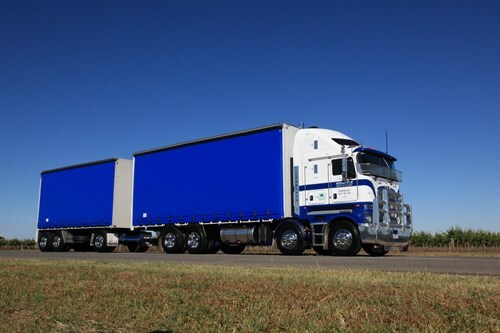 "I’ll be sticking to the Australian-made trucks from now on. The Volvo did a reasonable job but a $30,000 bill for a gearbox at 500,000km was hard to take." To make sure he stays within the legal limits, Matthew opted for the 8x4. He is well aware that laws and the implementation of them are getting more stringent all the time. "With this configuration you can have a float at either end of the truck or trailer and you don’t have to worry about being overloaded," he says. Matthew can remember the early Bedfords. He thinks the family business had every model of Bedford truck, but he cut his teeth on those old girls. "They were long, hard yards but it was a lot more fun back then. There was more comradeship and you were never in too big a hurry that you couldn’t stop and help someone," he says. According to Matthew, back then there were a lot of bags. It was a lot of hard work. It was all tarping, there were no gates. All the bags were loaded by hand and as a consequence, the men were a lot fitter. "Today, life as a driver is much easier but the OH&S issues are getting a bit over the top," he says. "We’ve all got brains and everyone has to use them a little bit more. Everyone has to use common sense." Matthew understands the chain of responsibility (COR) rules that must be complied with but believes despite the more you try, the authorities still seem to find little picky things they want done better. "Today, you have to leave your vehicle and stand in a little box provided, or in some instances now the truck is locked in a yard and you have to hand your keys over," he says. "Safety gear, vests, glasses and hard hats are no problem but other things are so frustrating. Safety is good but it can be costly to the business and to us as operators," Matthew says. "It has taken many years of hard work to get to this stage." 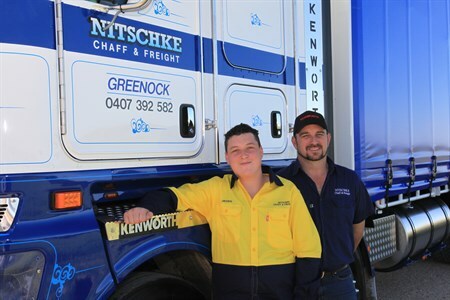 His son Jayden is keen to get behind the wheel of a truck as soon as possible, although Matthew would prefer that he had a trade behind him. "I learnt a lot with Jim Roocke at Nuriootpa Traders," Matthew says. "I used to do groceries from Adelaide to the Barossa and wine on the return leg. "When I started there, they had two tautliners and up to eight flat tops and they had a couple of set-ups like mine. "There was a lot of tarping. You’d tarp your vehicle like it was going to Perth even though you were only going 70km down the road," he recalls. Originally Matthew was going to put a changeover body on the Kenworth but went for a new body built by Alltruck. "It’s a fantastic body, very sturdy, very strong and I can’t actually fault any part of it. "We opted for a sleeper as we stay away at least one night a week," Matthew explains. "You can stand up and get your clothes on; the whole cab design is very good." Matthew wanted a truck with selective catalytic reduction (SCR) and AdBlue. He says the Cummins engine runs cool and smooth and he believes it will be reliable. "The automatic is great. The UltraShift has no clutch pedal which makes it very easy, anyone can drive it. Automatics in the Eaton range have come a long way," he says. Matthew has tricked up the Kenworth a bit, adding dual 7-inch (17.8cm) stacks and chrome rims, and he also wanted 100 tubes on the bullbar. With deliveries all over the state, including Whyalla to Peterborough and everywhere in between, the bar is not just for looks. "If you have a big square truck, it’s no good having a little bullbar on the front of it," he says. The truck and trailer combination gives Matthew a lot of flexibility, notably being easy to manoeuvre in and out of tight spaces. "We needed something that bent in the middle," he says. "The K200 is like driving a car around the city and makes the job so much easier." According to Matthew, the horse industry has quietened down in the past 10 years, so the company has slowly slipped into general freight, as well as carting machinery. Much of their work has come through word of mouth without having to advertise. "We don’t have set runs, the chaff goes in all directions," Matthew says. "We on-forward a lot of our freight so drops can be very quick, although some runs have 30 drops and pick-ups. "People on interstate say they have two to three drops, then they hear how many we have and just about fall over," Matthew laughs. Reg has owned a long line of Kenworths, and he's looking to make it even longer.